​Totaling 11.7 acres, this park was named after Mother Elizabeth Seton (1774-1821), the first American-born saint of the Roman Catholic Church. The hospital and sanitarium bearing her name stood on the site of both the present day park and The Whitehall until 1955 when it was demolished. The park contains several modular jungle gyms, a sprinkler system, an array of basketball and tennis courts, two baseball fields, a comfort station, a flagpole with a yardarm that bears the United States, City of New York and Parks flags, and several sitting areas. At the Northeast corner of the park, on Independence Ave. and 235th St., sits the Spuyten Duyvil Branch of the New York Public Library, another convenient cultural center for Whitehall residents. Seton Park, as seen from The Whitehall. 11-acre park includes ballfields, tennis courts (at left in photo), seating areas, a dog run, chess and checkers tables, and basketball and handball courts (not visible at right). Large building at lower right is the Spuyten Duyvil branch of the New York Public library. View is to the West, with the Hudson River and Palisades cliffs of New Jersey beyond at the top of the photo. ​Riverdale Park Preserve, alongside the Hudson River and accessed from 232nd St. and Palisade Ave., is known for its secluded beauty, 50 acres of thick woods, spectacular views of the Palisades along the Hudson, and as a haven for birds. Twenty-seven species, including the screech owl (Otus asio), have been confirmed as breeding in the park. The bedrock of Riverdale is billion-year-old Fordham gneiss, the oldest rock formation in New York City. On top of the gneiss lies Inwood marble, which was once quarried in Riverdale for the production of lime. Remains of two lime kilns stand in the park today. 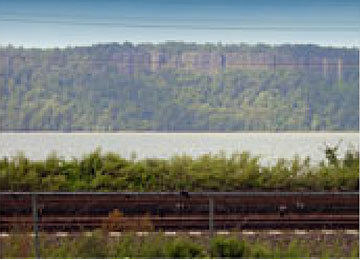 Riverdale Park - view of the Hudson River and cliffs of the Palisades from the Raoul Wallenberg Memorial Forest area. ​Wave Hill is a 28-acre estate, consisting of public gardens and a cultural center on the west side of the Henry Hudson Parkway near 249th St. It is situated on the slopes overlooking the Hudson River and the New Jersey Pallisades, in the subsection of Riverdale known as Hudson Hill. Wave Hill is an attraction for horticulturalists from all over the Northeastern US, and can be regarded as a botanical garden. The estate includes two houses, and is on the National Register of Historic Places. The gardens are designed so that there is always something colorful and interesting to look at, even during the winter months. In addition there are plants in flower all year long, both indoors in the greenhouse, and outside in the garden. The views across the Hudson River are striking in both summer and winter. Wave Hill offers changing contemporary visual arts exhibits in the Glyndor Gallery in the main house, as well as outside on the grounds. 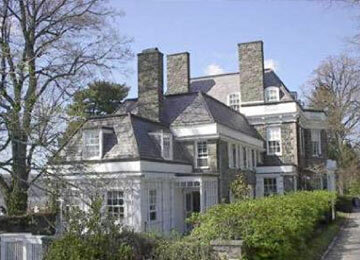 Wave Hill mansion (occupied at different times by Mark Twain and Theodore Roosevelt). ​The original Wave Hill House was built in 1843 by William Lewis Morris in Greek Revival style. It was owned from 1866-1903 by William Henry Appleton, who enlarged the house in 1866-69 and again in 1890. During these years, the house was visited by Thomas Henry Huxley, who helped Charles Darwin bring evolution to the public's attention. Theodore Roosevelt's family rented Wave Hill during the summers of 1870 and 1871, and Mark Twain leased it from 1901-1903. The Bronx Zoo is the largest metropolitan zoo in the United States. It comprises 265 acres of park lands and naturalistic habitats, through which the Bronx River flows. 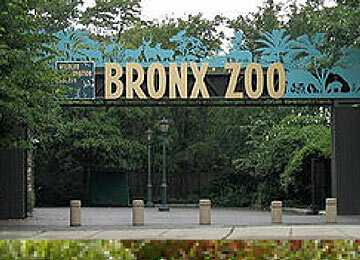 The Bronx Zoo is situated just south of the New York Botanical Garden. Fordham University owned most of the land which became the Bronx Zoo and New York Botanical Garden. Fordham sold it to the City of New York for only $1,000 under the condition that the lands be used for a zoo and garden; this was in order to create a natural buffer between the university grounds and the urban expansion that was nearing. "Asia Gate" at the Bronx Zoo. The zoo (originally called the New York Zoological Park) opened its doors to the public on November 8, 1899, featuring 843 animals in 22 exhibits. The first zoo director was William Temple Hornaday. The original permanent buildings were designed as a series of Beaux-Arts pavilions grouped around the large circular sea lion pool. Many exhibits, for example World of Birds and World of Reptiles, maintain the original taxonomical arrangement, while others are arranged geographically, such as African Plains and Wild Asia. Today, the Bronx Zoo is home to more than 4,000 animals, many of which are endangered or threatened species. 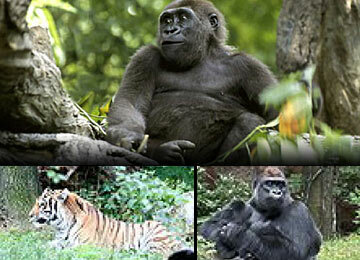 Just a few of the species in natural habitats at the world-famous Bronx Zoo. Van Cortlandt Park is an 1,146-acre park bordering Riverdale in the Northwest Bronx and is the fourth largest park in New York City, behind Pelham Bay Park, Flushing Meadows Park and Staten Island Greenbelt. The park is operated by the New York City Department of Parks and Recreation. The park was named for Stephanus Van Cortlandt, who was the first native-born mayor of New York, and the Van Cortlandt family, which was prominent in the area during the Dutch and English colonial periods. Contained within the park is the Van Cortlandt House Museum, the oldest building in the Bronx. The Van Cortlandt family land was used during the Revolutionary War by Rochambeau, Lafayette, and Washington. It was in this area that the Stockbridge militia was destroyed by the Queen's Rangers; a stone memorial was placed at "Indian Field" in 1906. The eastern side of the park is served by the Woodlawn (IRT Jerome Avenue Line) subway station, and the western side by Van Cortlandt Park-242nd Street (IRT Broadway-Seventh Avenue Line). Van Cortlandt Park golf course. 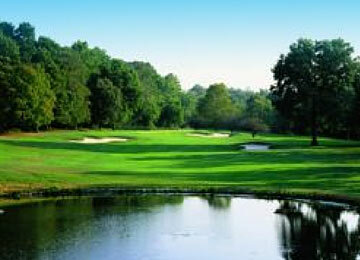 The Van Cortlandt Golf Course, the nation's first public golf course, opened in 1895 and is located centrally on the park grounds. The "Parade Ground" north of the museum in the western part of the park is one of New York's principal cricket fields. The Putnam Trail, an unpaved trail, runs north through the woods to the east of this lawn and west of Van Cortlandt Lake, through the golf course and along Tibbets Brook and the former New York and Putnam Railroad line into Yonkers where it connects to Westchester County's paved South County Trailway. Another bikeway runs east from the golf course's clubhouse to connect to the Mosholu Parkway bike path. The Old Croton Aqueduct Trailway begins in Van Cortlandt Park. 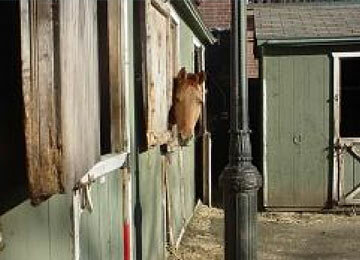 There are also popular horseback riding stables on the park grounds. Van Cortlandt Park - view of the Parade Ground near the start of the 2.5-mile cross country trail. 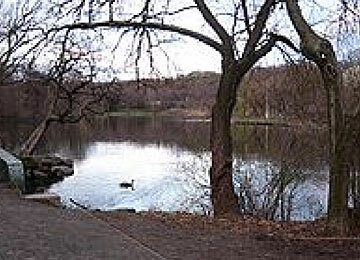 Van Cortlandt Park is a popular site for cross country running owing to its miles of cinder trails and hills. The path surrounding the Parade Grounds, known to runners as the "flats," is 1.37 miles around. The infamous "back hills" provide a 1.3-mile loop in the northwestern section of the park. The New York Botanical Garden is a museum of plants, an educational institution, and a scientific research organization. Founded in 1891 and now a National Historic Landmark, it is one of the greatest botanical gardens in the world and the largest in any city in the United States, distinguished by the beauty of its diverse landscape and extensive collections and gardens, as well as by the scope and excellence of its programs in horticulture, education, and science. 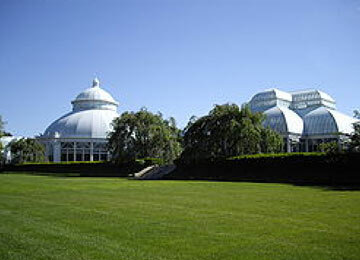 The Botanical Garden's curated living collections contain more than 1 million plants; its Continuing Education program is the largest and most diverse of any botanical garden in the world; its Children's Education program has been a pioneer in innovative, informal science discovery facilities and activities; and its scientific research on plants and fungi is unmatched in scope, depth, and authority. 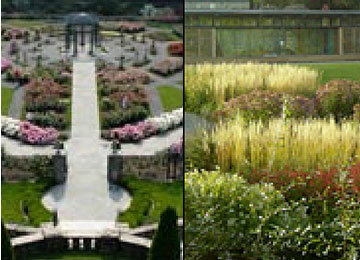 Formal gardens (left) and natural environment scenes (right) at New York Botanical Garden. ​The Garden's resources are as exceptional as its programs. They include the most important botanical and horticultural library in the world and an herbarium that is the fourth largest in the world and the largest in the Western Hemisphere. The greenhouses are the most sophisticated behind-the-scenes facility at any botanical garden in the United States, and the conservatory-a New York City Landmark-is the largest Victorian-era glasshouse in America. The Garden also offers a sweeping 250-acre landscape, 50 curated display gardens, an expansive 50-acre native Forest, and a wealth of programs, exhibitions, and activities for visitors to enjoy. The grounds display masterpieces, some dating to the 1840s, by many of the nation's most accomplished architects and designers, both past and contemporary. The Botanical Garden's innovative programs, unparalleled resources, and talented staff are rivaled by few and exceeded by none. For Whitehall residents, the park is an easy drive away, along Theodore Kazimiroff Boulevard curving around to Fordham Road.